Keeping kitteh safe when night falls is important. So important in fact, that Instructables user 'tareker' took to building an Arduino-powered cat flap to ensure his own feline friend stayed indoors after dark. The Pet Curfew cat flap is designed to "restrict the time when your pet is allowed to go outside", giving your pet the freedom it is usually afforded during the daytime, but placing a time limit on those evening socials. 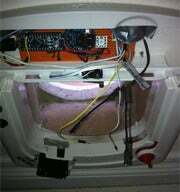 This custom cat flap is mainly made up of a Staywell pet door, but modified with an Arduino Nano V3 microcontroller. The combination of these, along with additional switches, resistors, and an all-important clock, make the standard cat flap that little bit smarter. Tareker's completed pet door will now know whether his cat is entering or leaving the house, and depending on the time of day, will take action accordingly. If the cat enters the house after a set time in the evening, the door will lock for the night--giving the owner peace of mind that their pet is safely inside. Plans to improve the custom cat flap have already been outlined--for instance, connecting the door to the web and adding a Twitter feed and website to indicate a pet's status as in or out of the house. A full rundown on how to make your own Pet Curfew cat flap can be found over on Instructables. Tesla Coils Play Nyan Cat Theme: Best Rendition Yet?